Welcome to Merveille, the royal capital of the Kingdom of Adalet. This glorious city has a long history and is enveloped in the smell of the sea thanks to it facing the Marle Ocean. 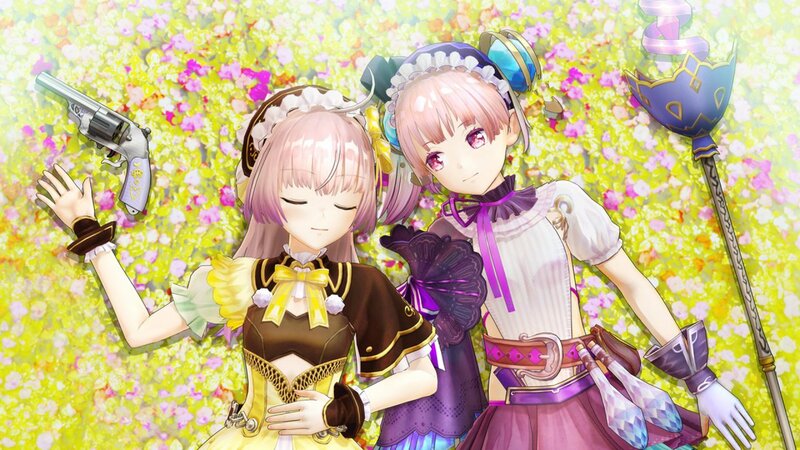 It’s also home to twin sisters Lydia and Suelle (or Sue) Malen, who, after their mother unexpectedly passes away, set out to keep the promise that they made to her, in making their atelier the best in the whole kingdom. The problem is that they lack experience, and, as we find out straight away in the opening prologue to Atelier Lydie and Suelle: The Alchemists and the Mysterious Paintings, the ingredients that they have to rely on for their alchemy are of poor quality. Their artistic but reclusive father (or “dummy-daddy” as he is constantly, and somewhat understandably, called) forbids them from ever entering the basement, but, when they hear an unknown voice calling their names, curiosity gets the better of them. Away from all the painting materials and unfinished canvases, they discover a strange painting that magically transports them inside its world. It is in this painterly dreamscape that they encounter a mysterious figure in the distance that looks remarkably like their mother, but also discover rare materials that will help them to synthesise higher quality items to make their atelier business the best it can be. And so, your adventure really starts. Atelier Lydie and Suelle: The Alchemists and the Mysterious Paintings has been released to celebrate the 20th anniversary of the Atelier series, and, Nintendo 3DS and Nintendo DS spin-off games aside, also marks the first time that the main series has ever been released on a Nintendo console. The third and final game in the Mysterious storyline, it works as a standalone adventure so you needn’t worry about having to have played Atelier Sophie: The Alchemist of the Mysterious Book or Atelier Firis: The Alchemist and the Mysterious Journey beforehand. Lydie, a smart and gentle girl who prefers to avoid physical activity, and Suelle, a tomboy with a cheerful personality that can be rather mischievous, make for likeable protagonists. When they learn that the Kingdom of Adalet has decided to proactively attract more alchemists, their next hurdle is to pass the entrance examination for the Atelier Ranking System to receive financial aid and special privileges. With fierce competition from the popular Atelier Borthayre, we can be thankful, then, that Ilmeria Von Leinweber appears as a mentor early on. Even without her guidance, the game does a great job at introducing the numerous gameplay mechanics that are at play. Gathering materials is as easy as pressing a button once you’re near them, you can nap on your bed to move time forwards, you must first learn recipes for items before crafting them, and the synthesis process is as simple as selecting your best quality ingredients in the relevant categories before Lydie and Suelle excitedly hurl them into a bubbling cauldron. There’s far more depth to it with coloured squares and Enhancing Agents to consider, but it’s best that the game explains the intricacies of alchemy to you rather than me. You will need to raise your Alchemy Level to create more interesting and worthwhile items, which is something that will naturally happen as you continue to progress and sink hours into the game. You can explore Merveille, the Town Map letting you fast travel between locations to save you time. Icons will indicate where the next main story event is, or where side story events and optional activities are. The interactions that you have with other characters unsurprisingly helps to breathe life into the world, as you take their orders and return to deliver the items that you have created for them. This is a good way to hone your synthesising skills, which will be important to help you pass the Promotion Tests for the Atelier Ranking System. The only other way that you will spend your time with Atelier Lydie and Suelle: The Alchemists and the Mysterious Paintings is in battle. While the paintings will magic you away to fantastical worlds, you can also travel to places that lie on the outskirts of Merveille. You will gather materials in both places, but you can also solve hints in the Recipe Book to discover new items to synthesis and, as can be expected from a role-playing game, come face-to-face with marauding enemies in battle. These turn-based encounters aren’t particularly remarkable seeing as they are fairly standard for the genre, with the only difference in approach being the six characters that you eventually have access to and the way that you can arrange them in formation. Atelier Lydie and Suelle: The Alchemists and the Mysterious Paintings readily enchants with a charming story and some fantastical worlds to explore. But, while the game’s greatest strength lies in the depths of its alchemy system, Gust has failed to have thrown enough new ingredients into their murky cauldron to innovate on the experience as much as has been seen in what came before. What we’re left with is a rather average concoction.